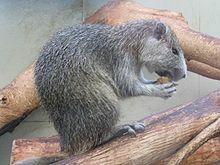 Capromys pilorides (Desmarest's Hutia), a member of familia Capromyidae. Capromyidae in Mammal Species of the World. This page was last edited on 23 February 2019, at 00:08.